These ten silly cars think they're people, too! Tom Selleck is most associated with the Ferrari 308 he drove on Magnum PI but I think the 1950 Mercury is more appropriate. Stare at a '50 Olds for a while and you'll begin to see a bit of a droopy face. Every Mini from the original to the modern Paceman has a similar, concerned face. It's as if they're all clenching their nonexistent teeth. If I was a mob boss, this is what I'd drive. Strike fear into everyone before you even open the door of your car. I just wanna pinch it's adorable baby cheeks. Don't you? In the mold of classic '60s roadsters with their oval grilles and round, simple headlights the Nissan Figaro has quite an adorable face. With their new Kodo design language taking over the lineup, the cheerful grin of the last-generation Mazdas is quickly disappearing from showrooms. If you want a new car with that happy face, the Mazda5 is your only option. This obscure Hungarian microcar (right) looks more like something from Cars than something that exists in the real world. Exist it did, though, with a rear-mounted motorcycle engine and a roof that could be pushed backwards for ingress. The car equivalent of a Napoleon complex. 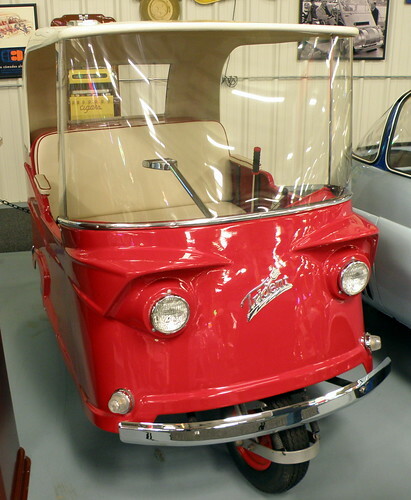 While we're on the subject of obscure microcars, we should talk about the hilariously anthropomorphic Trident featured on this very site a few years back. The Trident in stock form looks a lot like a person with its raised eyebrows, but this particular one takes it even further. Did you really think anything but the Sprite could be first on this list? It's the happiest looking car ever made. You couldn't possibly be mad when you inevitably break down on the side of the highway in one of these.